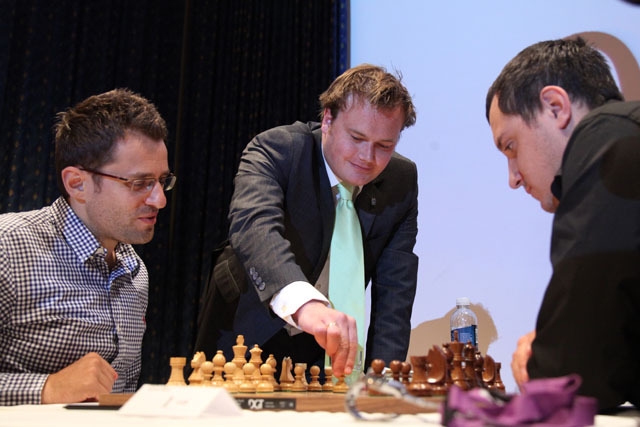 The first games of the World Chess Cup 2013 opening round started in Tromso after Commissioner for Business, Culture and Sports of Tromso Municipality, Mr. Jonas Stein, made the first symbolic move in the Aronian-Markov game. The first day was marked by strong security measures, interesting games with a few surprises, and a minute of silence for GM Kurnosov. The favorites in the higher half of the draw met significantly lower rated opponents. The top seeds won their games relatively easily, but there were also a few surprises like the loss by Super GM Alexander Morozevich against Canadian GM Bator Sambuev. The American player GM Ray Robson won a beautiful game against the higher rated opponent GM Andrey Volokitin. GM Gata Kamsky and GM Michael Adams drew against Chinese players Lou Yiping and Wan Yunguo respectively, while the Chinese derby between Wang Hao and Liu Qingnan also finished in a draw. Playing with Black former Women’s World Champion Hou Yifan drew against GM Alexey Shirov. Current European Champion GM Alexander Moiseenko had a rest day as his opponent GM Adly Ahmed from Egypt had to enlist for obligatory service in the Egyptian Army and could not make it to the tournament. Sofia Rules are not in force at the tournament so it’s up to the players to decide when they want to offer a draw. The first game to finish was Zvjagintsev-Swiercz, 12 moves.